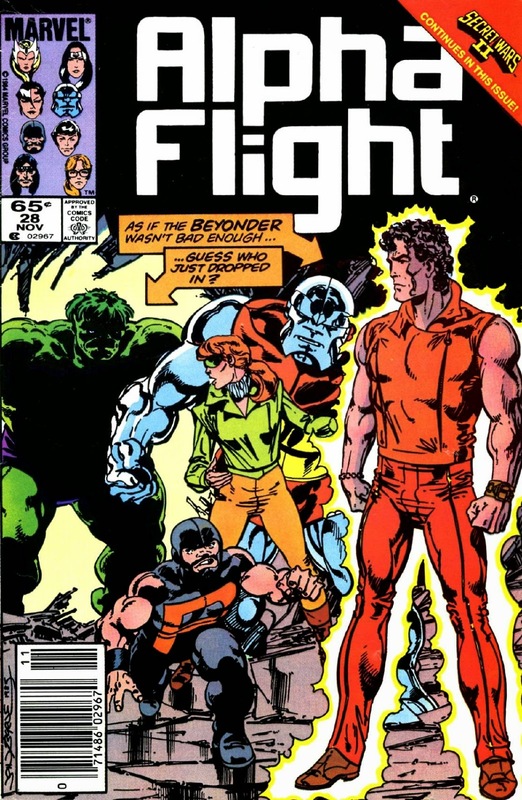 1985: Alpha's Beta Flight part V: Byrne 'n Body Switcheroo... Plus the Beyonder too! 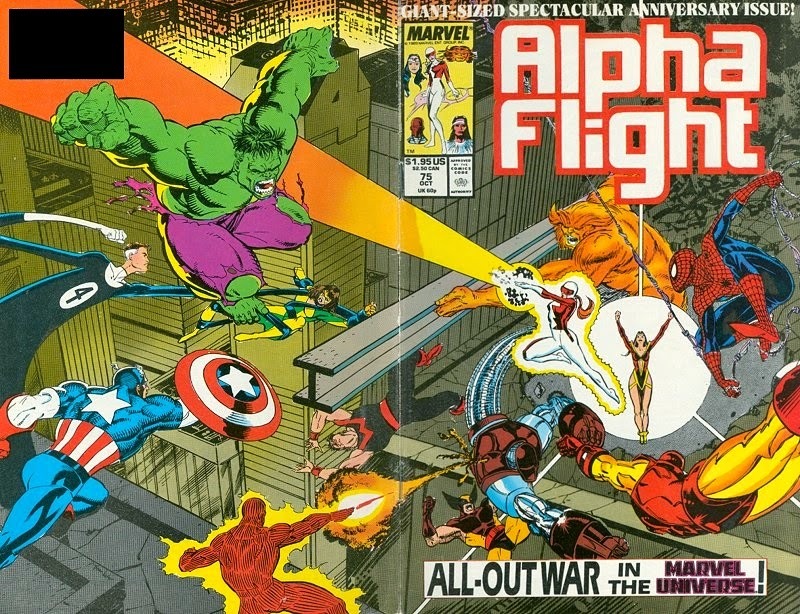 In the fifth and final entry of Alpha's Beta Flight, John Byrne's finally on his way out the door but his send off includes the return of Omega Flight, a visit to the West Edmonton Mall and more guest stars you can shake a stick at... But Alpha will try and do just that anyway. 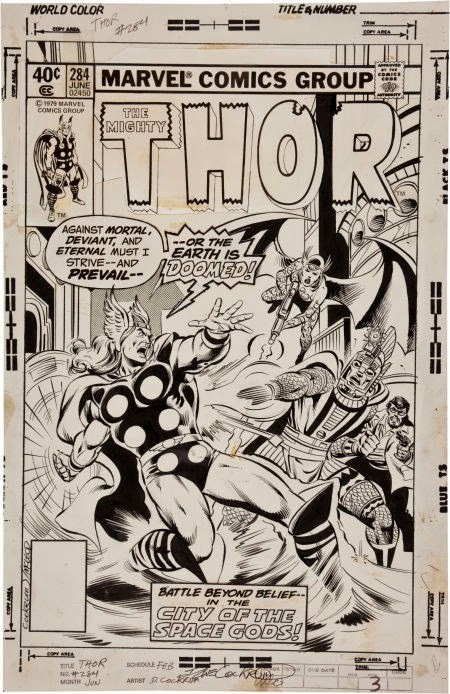 "As if the Beyonder wasn't bad enough..."
Your name is John Byrne. 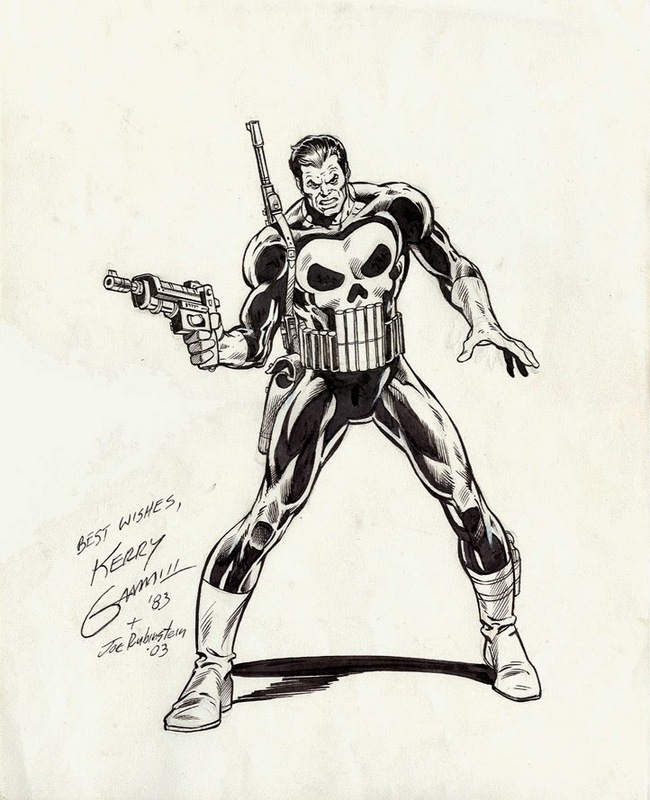 You're a wildy succesful comic book creator forced to do a series you never particularly cared for. What do you do? 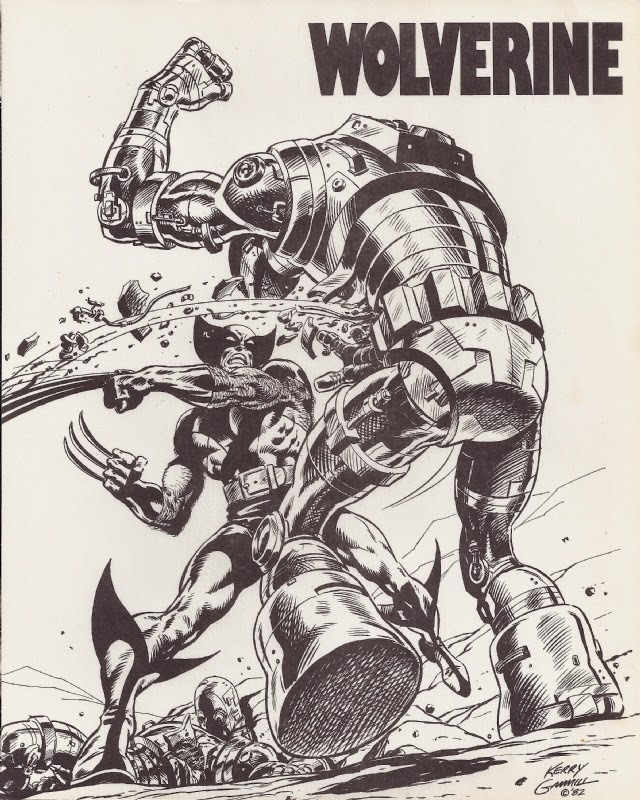 In the Summer of 1985, after 28 issues of Alpha Flight, John Byrne found a way to escape to greener pastures by somehow convincing Incredible Hulk writer Bill Mantlo to trade titles. 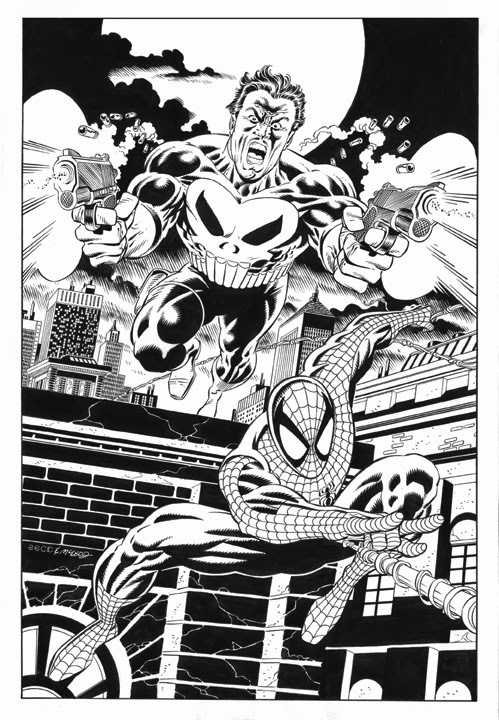 Let's review how Byrne worked towards his great escape. 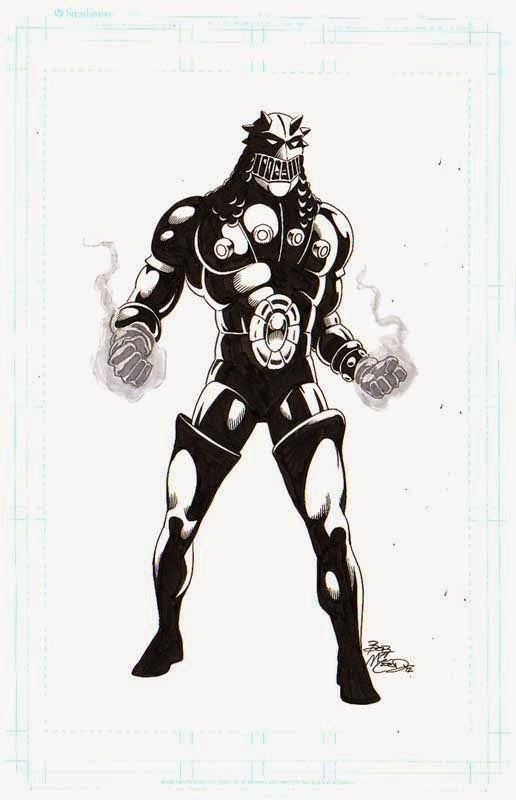 As you might recall, #25 ended with the reveal that Alpha's leader Guardian wasn't really dead after all. Sure, his explanation how he survived the seemingly fatal explosion of his battle suit was a tad farfetched to say the least... But everyone mostly seemed happy to see Mac again. So, it's no surprise #26 opened with a "business as usual" vibe as Guardian leads his team against the threat of the Macro System. "You look like reasonable robots, I'd think the choice would be easy, eh?" After a few pages of Alpha busting up these Transformers/Go-bots/Shogun Warrior rip-offs it turns out the robots were actually created by the Canadian military and the Flight were invited to fight them as part of a final field test. The Macro System never appeared again after this, so it's likely they failed this test or maybe the good people at Hasbro caught wind of the project and filed for copyright infringment. 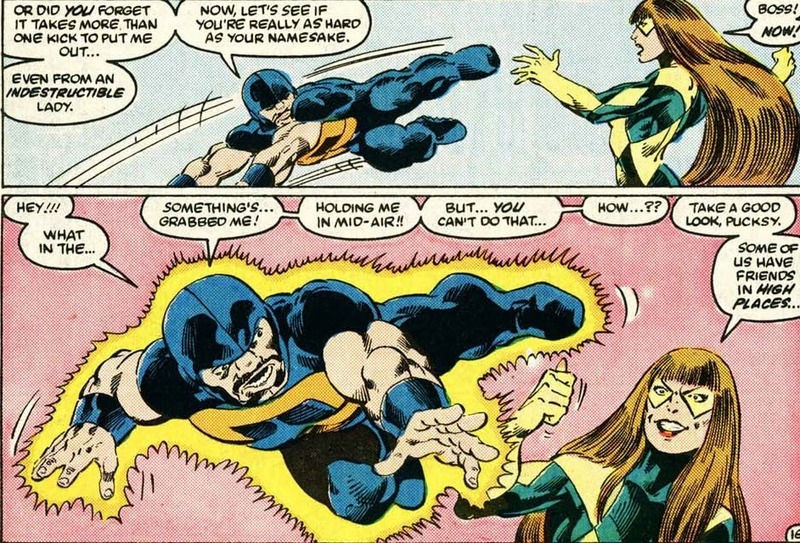 So far so common for Alpha Flight, but things were about to take a turn for the terrible. 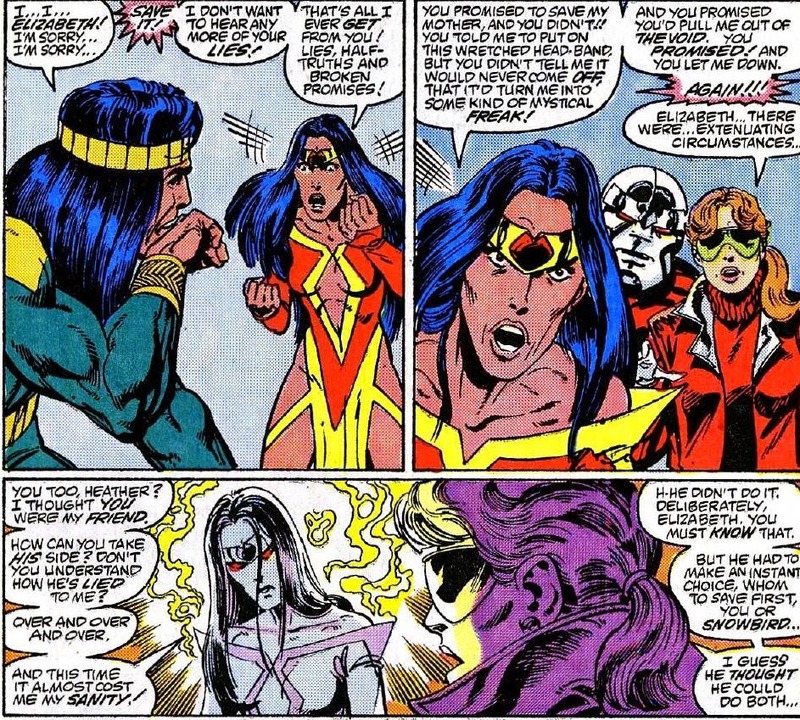 The soldier delivers a message from Heather Hudson to Guardian, informing him that she and Northstar had uncovered a situation at the West Edmonton Mall deserving of Alpha Flight's attention. 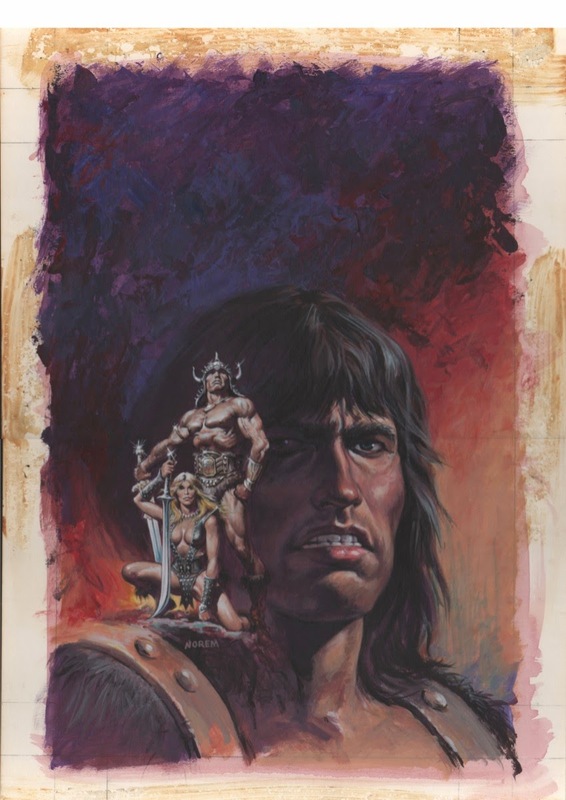 However, Aurora had suffered a few cracked ribs fighting the Macros, forcing Shaman and her boyfriend Walter Langkowski (still stuck in the Box armor) to stay behind and care for her. 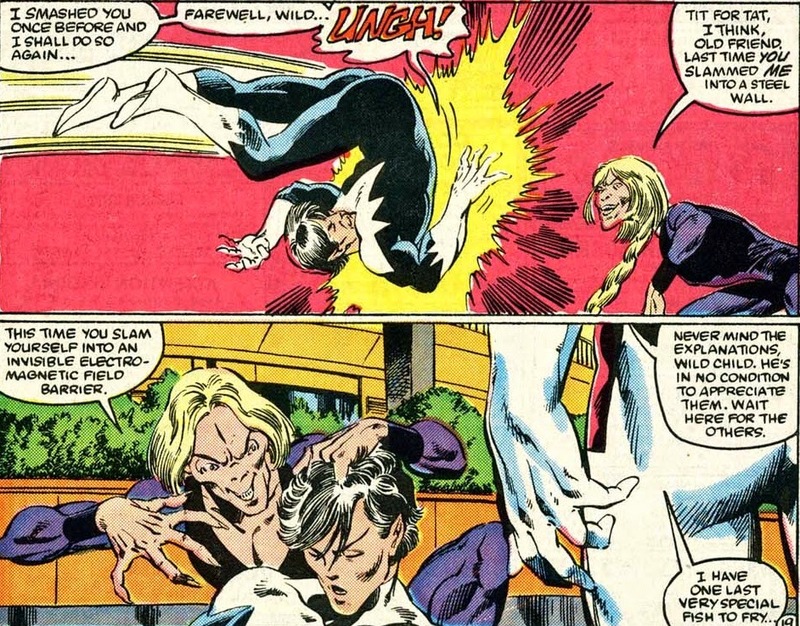 Guardian left with Puck and Talisman and as soon as they arrived at the evacuated mall they learned that their teammates were still inside, along with the reason for Heather's distress call: Omega Flight. The Alphans quickly entered the enormous shopping mall to look for friend and foe. But unfortunately for them, Omega Flight had a mysterious new leader who helped his teammates beat the heroes almost singlehandedly. "I have one last very special fish to fry..."
Can you guess who it is? 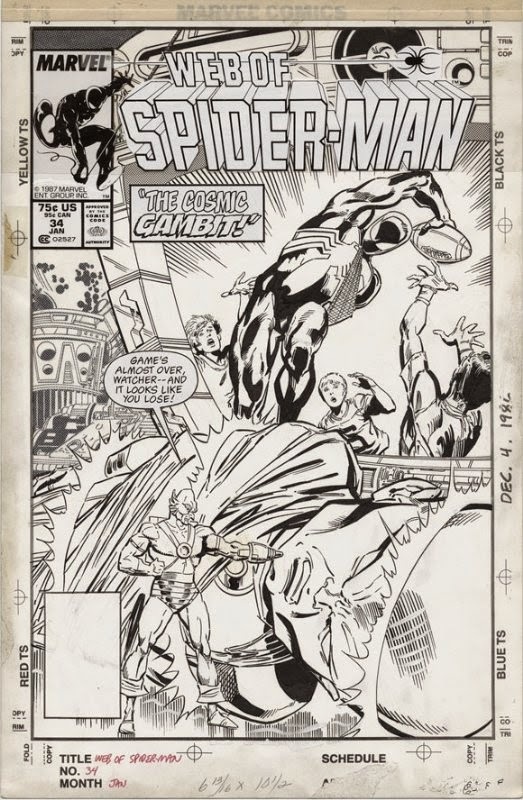 The reveal is wonderfully subtle, showing Byrne's clear choice to build the suspense by slowly showing more and more of this mysterious new threat. Still, Heather Hudson had no idea who it was when she caught up with her husband. 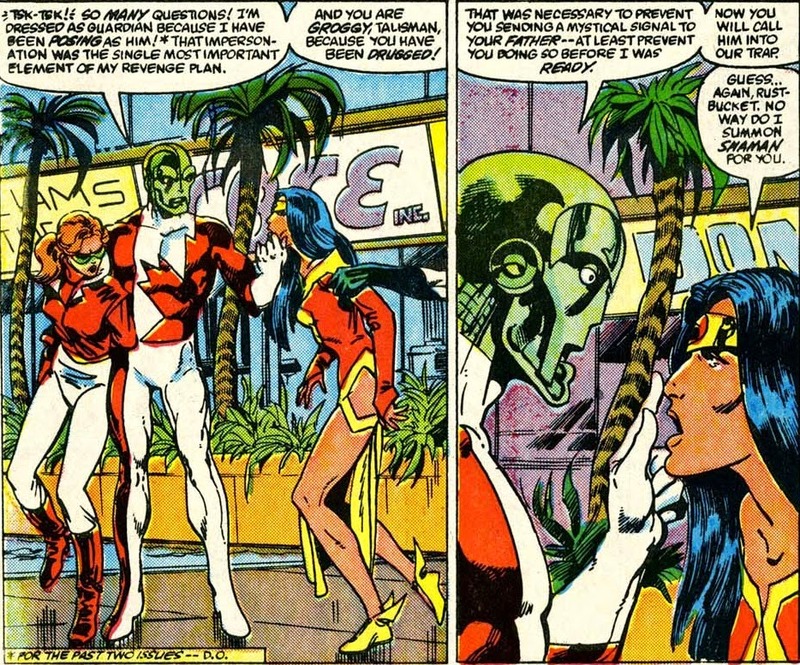 She was understandably relieved to see him... but then his voice suddenly shifted to that of Omega Flight's deceased leader Jerome Jaxon and the final, awful truth was revealed at last. 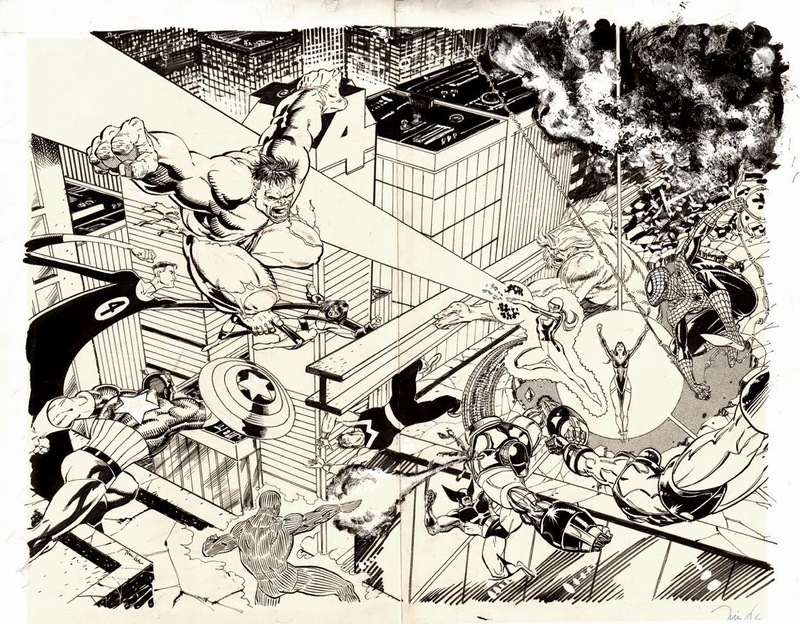 the destruction of Alpha Flight!" No, Jaxon is still dead... That's actually his robot aide Delphine Courtney who was also instrumental in Guardian's death back in #12. Courtney had herself outfitted to resemble James McDonald Hudson and once and for all dispelled the notion that robots don't possess imagination by coming up with that utterly ridiculous "I was stranded 10.000 years in the past on Jupiter's moon Ganymede where a race of ancient alien ice squids rebuilt me into a cyborg..." excuse for Mac's seeming survival. 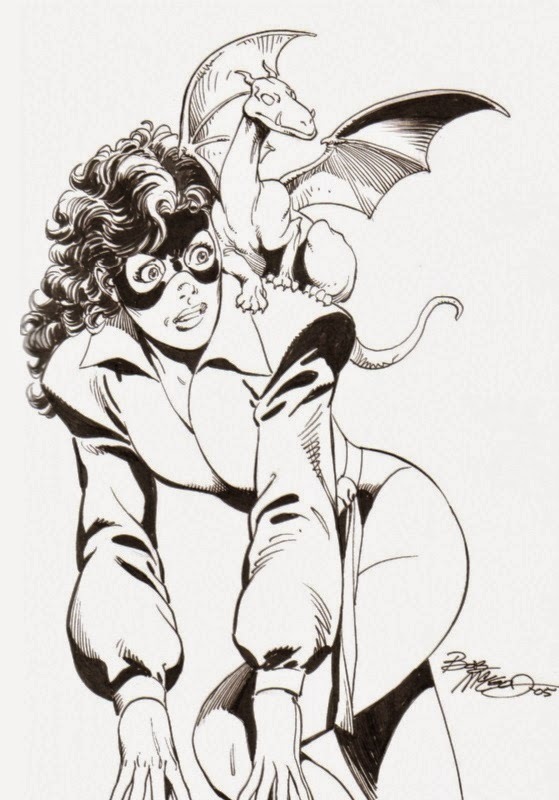 Still, one wonders if Byrne would have reveal Delphine's trickery if he hadn't been scheduled to leave the book. 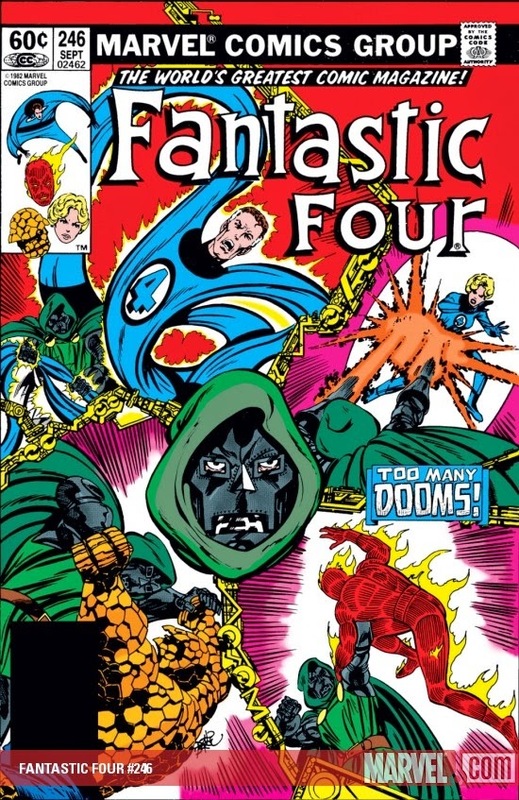 After all, there's a natural arc to these kind of stories and reintroducing a long lost character only to have him turn out to be the bad guy halfway through the next issue doesn't exactly deliver the big, emotional pay off you'd be aiming for. 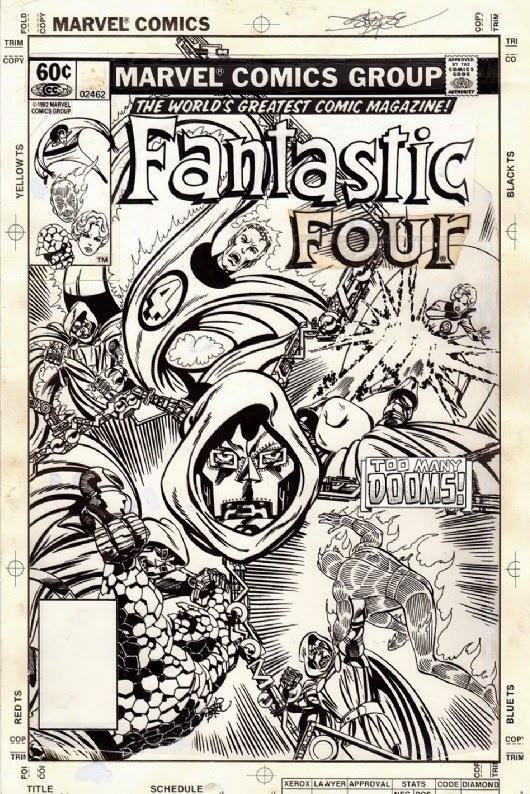 But with only two issues left to go, Byrne was in a hurry as we'll see in the opening pages of #27. "No way do I summon Shaman for you." Courtney expected Talisman's lack of cooperation, that's why he/she/it simply started to torture Elizabeth until her father's mystical senses picked up his child's distress. This would bring the remaining Alphans to Edmonton where Omega would be waiting for them. As plans go, it's actually not the worst idea in the world. 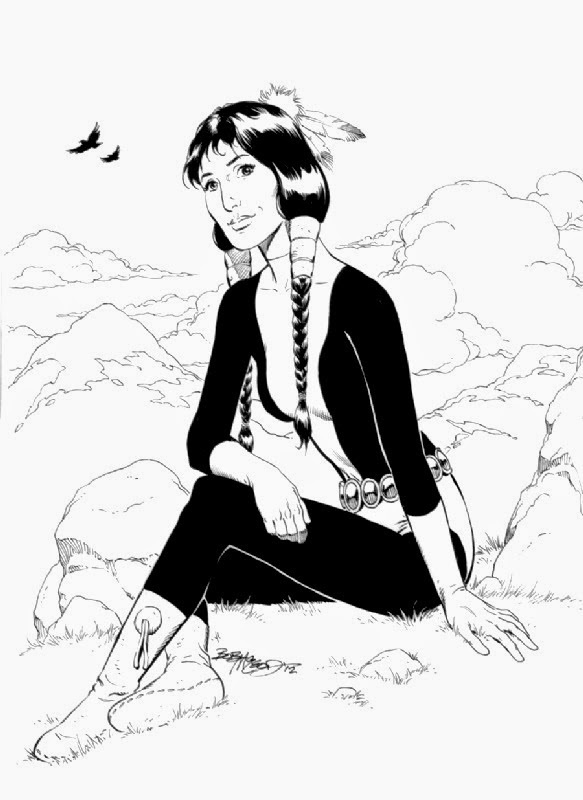 Shaman was still in the team's Vancouver base where he'd just used a combination of western medicine and magic to take care of Aurora's injuries. Together, they accompanied a very excited Walter Langkowski to the lab of Roger Bochs. Turns out he'd found a suitable new body for Walter to inhabit. Gee, wonder who *that* could be, eh? Before they could explore the options of getting their hands on this new body, Shaman sensed his daughter's pain and teleported himself, Box and Aurora to her location. Unbeknownst to everyone, Snowbird had also felt Talisman's pain and started to make her way towards Edmonton. This was a big deal, since she'd actually been pretending to have left the earthly planes altogether after killing Sasquatch in #24. "Guardian" meets Shaman, Aurora and Box as soon as they arrived. Unaware of their leader's true nature, they initially buy his cover story about Alpha Flight having already taken care of Omega Flight. However, "Guardian" (along with human rights activists everywhere) loses his cool when Shaman casually mentions he's still carrying the miniaturized, comatose Omega Flighter Smart Alec around inside his medicine pouch. Incensed, Courtney grabs the Sarcee's medicine bag and flies off in hopes of retrieving Alec. When the bag proves to be empty, the frustrated robot turns it inside out, figuring there might be a secret pocket he missed. This move released the void, the universe that dwells beyond the mouth of Shaman's pouch. It needed to be contained quickly before it took over all that is. 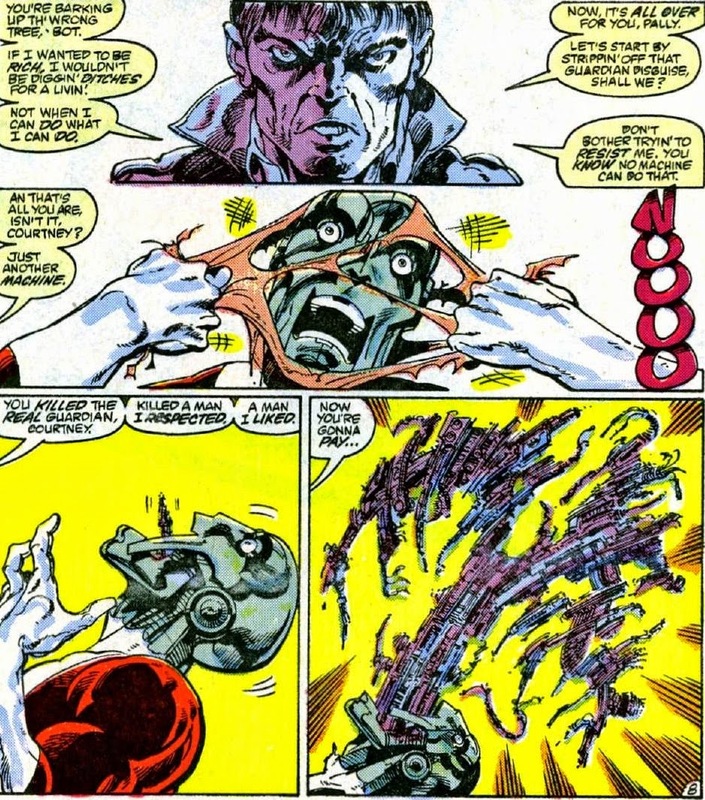 Before he could do anything, the Void claimed most of Alpha Flight even as Omega Flight made a run for it. Still, Shaman needed help and that's why he called on his barely conscious, drugged and tortured daughter. "Talisman! Talisman! Elizabeth, can you hear me?" Yes, wouldn't every loving father call his injured daughter by her codename twice before actually remembering her real one? 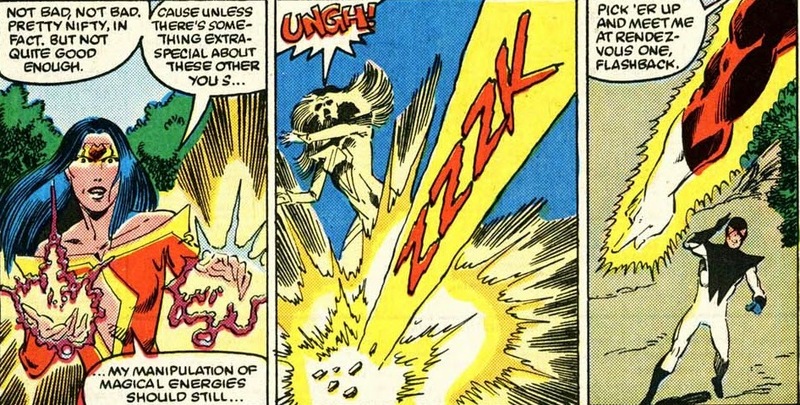 And it got worse, he convinced her to dive inside the void to get Alpha Flight out before exposure to the maddening effect of otherworld would turn them incurably insane. Reluctant to risk her own sanity, Shaman assured Talisman he'd do everything to make sure she got out too. And we know Michael Twoyoungmen's as good as his word... Just ask his dead wife. 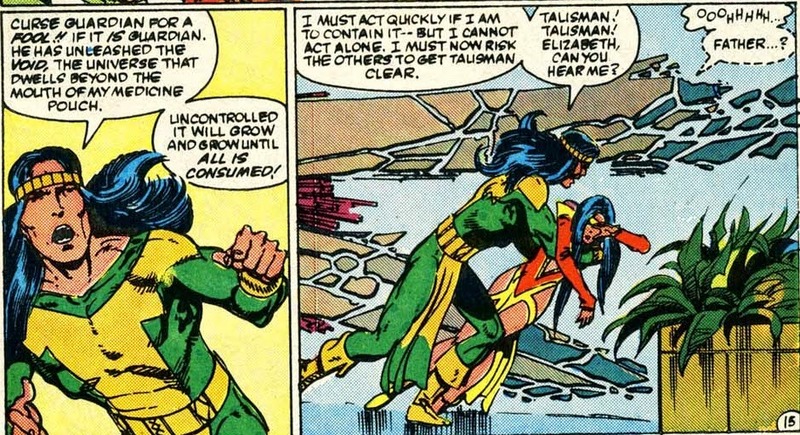 Still, despite the fact she could barely stand or form a coherent sentence, Talisman did her job and retrieved her fellow teammates while Shaman used his own powers to slowly drive the void back into his pouch. All in all, it felt like an easy victory... until this happened. "This will take but a moment, Elizabeth. Be brave, I shall not fail you." Unbelievable... It's like Shaman gets his powers from continuously making the wrong call. Even if he decided to save Snowbird first, he does so by reaching into the same void he needs to pull his daughter out of. You went to medical school, didn't you Michael? Remember how they taught you humans actually have two hands? Try and use them next time. "You can do it! You have the power!!" You have the power? C'mon, Shaman... Don't blame this on the power of Grayskull, she's Talisman, not She-Ra. #27 closes out with a horrified Shaman realizing he'd just doomed his daughter. 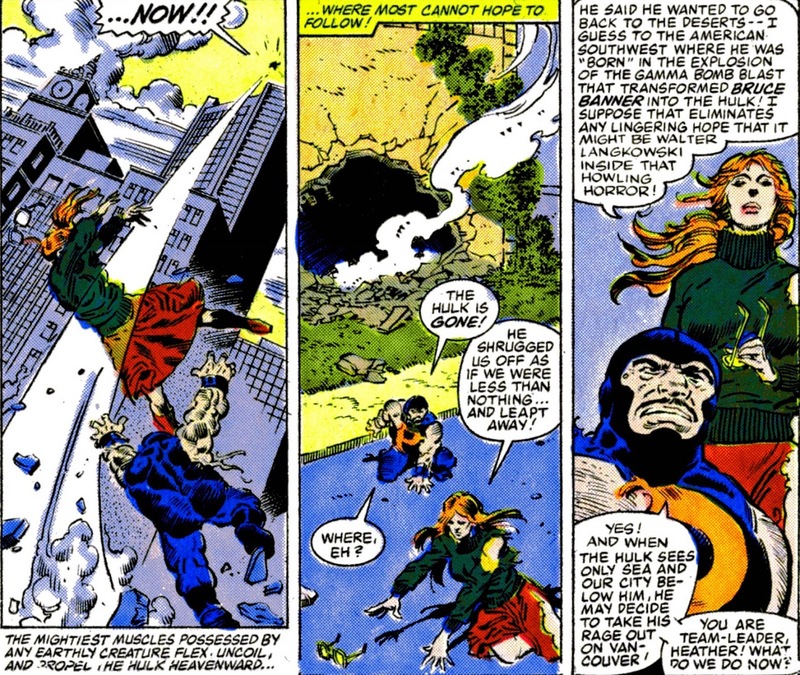 And, what's an even bigger travesty: she would actually be rescued by the Beyonder in Secret Wars II#4. 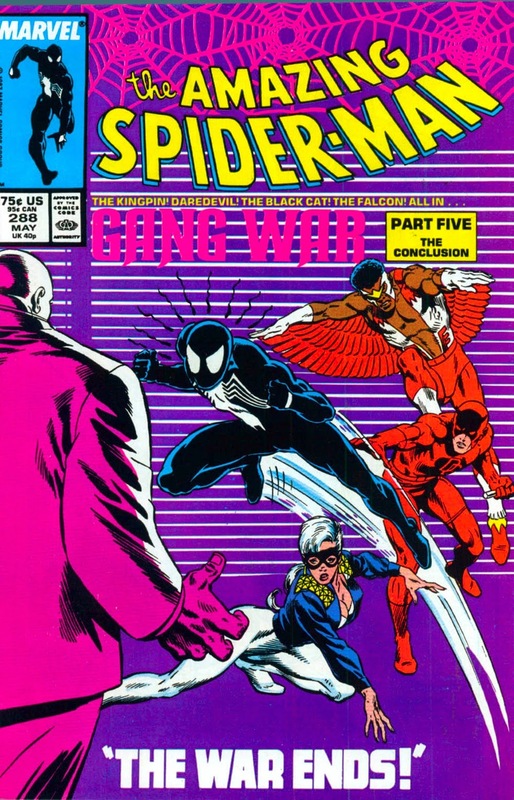 Yes, the tail end of John Byrne's Alpha Flight run coincided with Marvel's first company wide crossover, a sequel (in name only) to 1984's smash hit Secret Wars. The Beyonder was on Earth now and up to all kinds of mischief. In his Jim Shooter penned limited series, the One from Beyond popped up all over the place to make the lives of the heroes... and their creative teams... miserable. 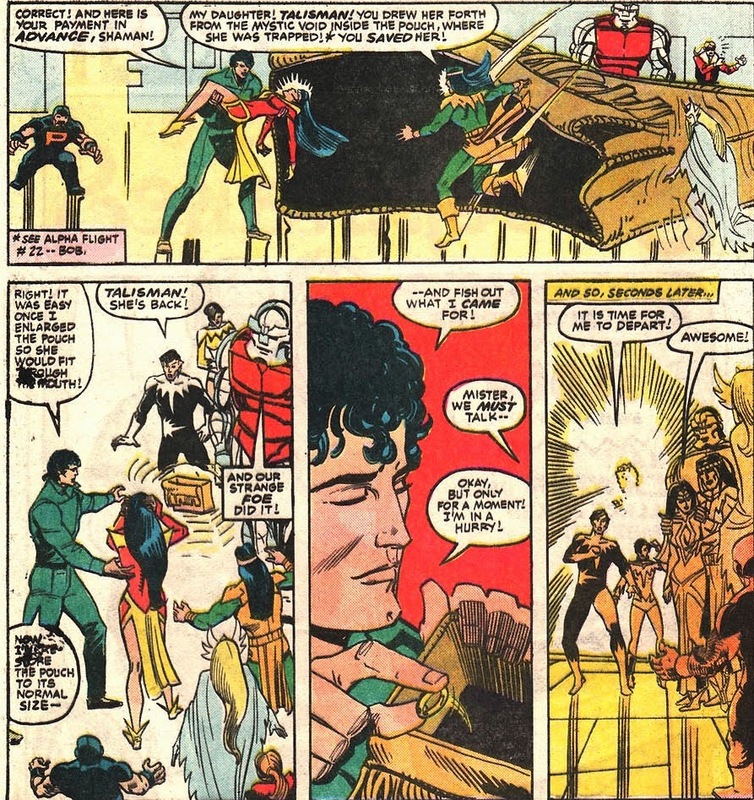 For instance, Beyonder appeared moments after Talisman vanished to get a gift for Dazzler, who he had been trying to romance earlier that issue. "...And fish out what I came for." 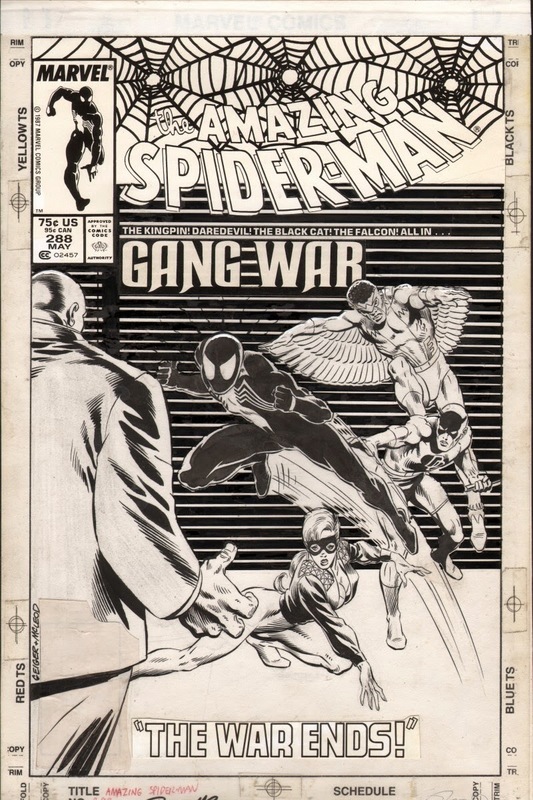 Byrne's take on that particular scene from Secret Wars II#4 appeared in Alpha Flight I#28, which opened with the final fate of Omega Flight. 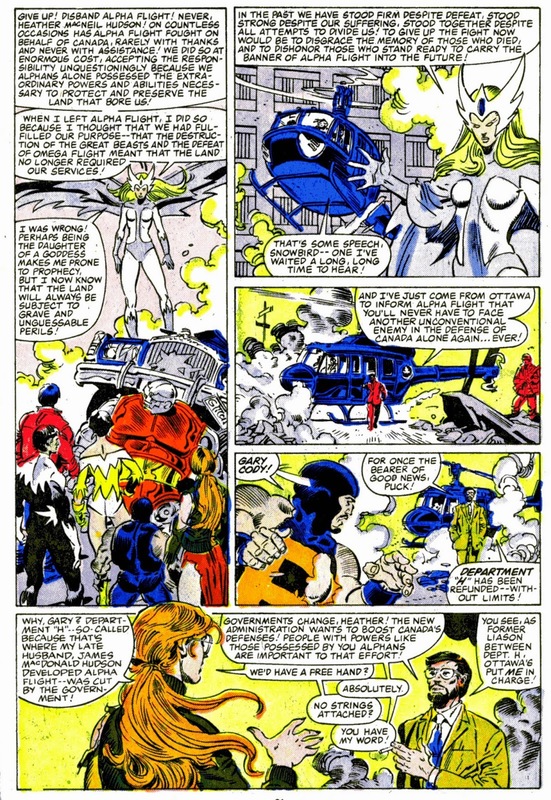 As they were fleeing the mall, they were attacked by Madison Jeffries who had also come to Edmonton to help Alpha Flight. He singlehandedly defeated the team by turning a station wagon into Rover, a mechanized Deadpool lookalike avant la lettre. Jeffries then focused his attention to Delphine Courtney in a rather gory sequence, even if it's "just" a robot. 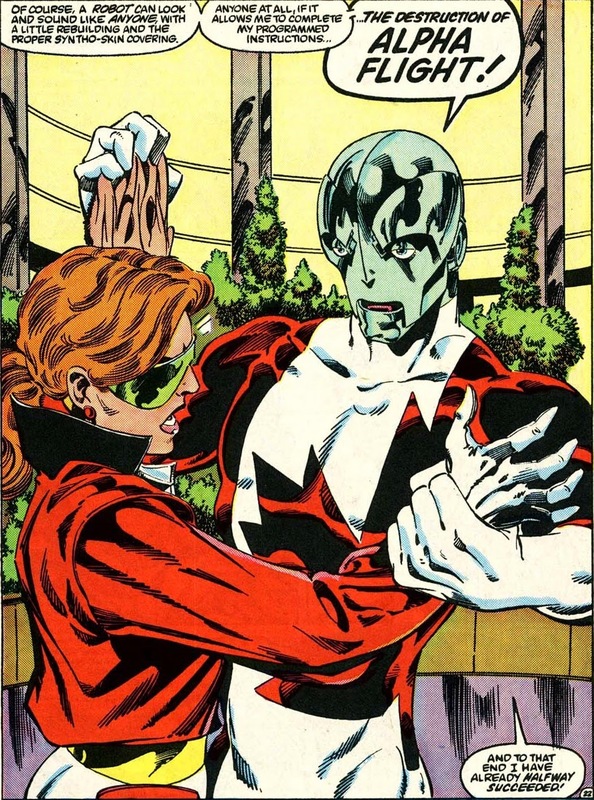 With Rover guarding the unconscious Omega Flight members, Jeffries was free to enter the Edmonton Mall to look for Alpha. 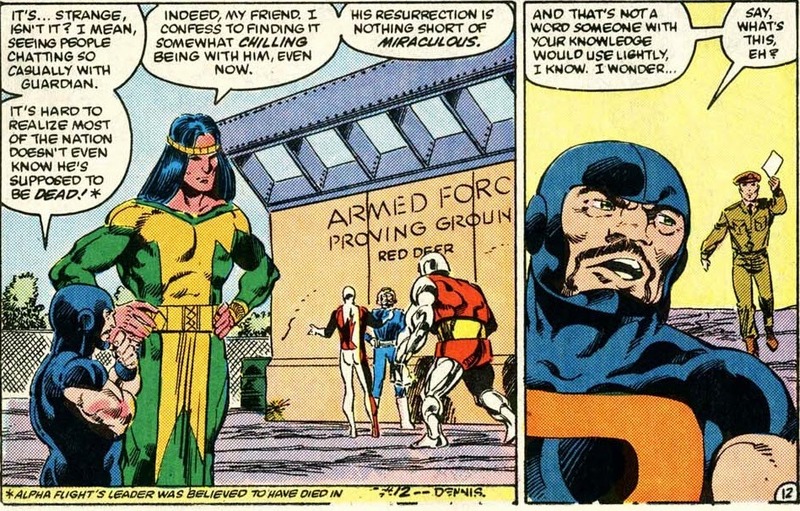 He caught up with them just as the Beyonder was finishing his conversation with the team and teleported away. Right around the same time, Talisman woke up and to say she was a tad ticked off is putting it mildly. "Shove it! I don't want to hear any more of your lies!" And who can blame her, really? After rattling off the embarrassingly long list of instances he'd failed her, Talisman got even more furious when Heather Hudson tried to make her see Shaman's side. Not exactly the smartest thing to do when a daughter just watched her father condemn her in favor of saving a relative stranger. Fed up, she teleports all of them to their Vancouver facilities, except for Snowbird who (rather conveniently) can't be teleported against her will. Once home, the full weight of all his bad choices finally hit Shaman. In the end, I have treated her no better than one of my mystic tools." "Roger... What in blue blazes are you doing here?" "Walter Lang...? I once roomed with you back at the university..."
What are the odds! Guess it's a small pandimensional crossroads of realities after all. 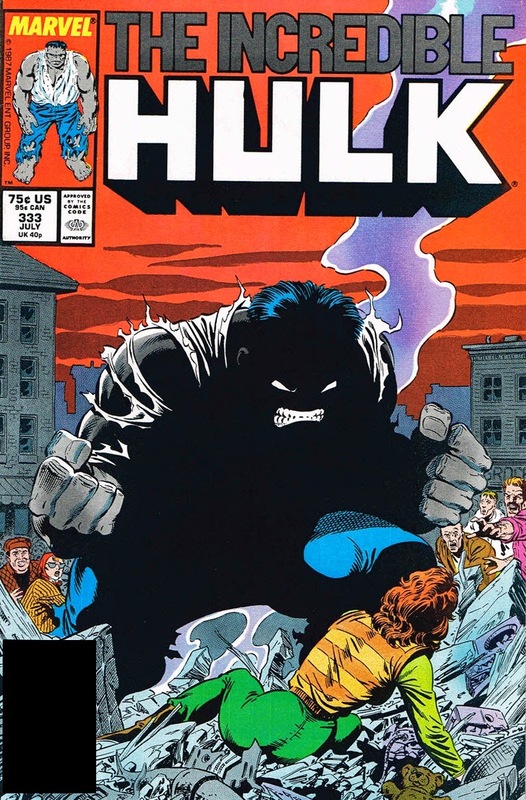 After talking it over, Banner was thrilled with the idea of Langkowski as the new Hulk, in no small part due to the fact he'd been craving the sweet release of death. 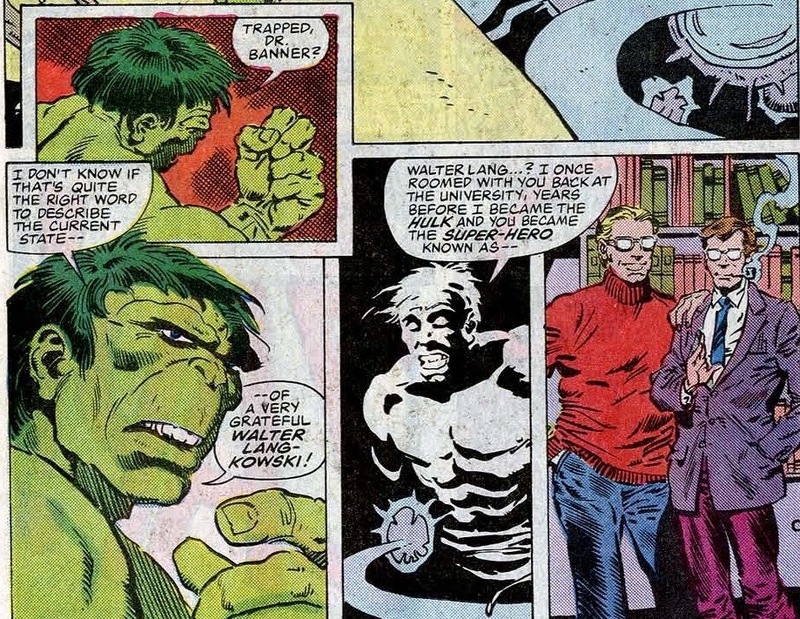 However, that didn't sit well with Walter who decided it'd be for the best if he sacrificed himself to make sure Bruce was reunited with the Hulk again. "No! I don't want to be the Hulk!" 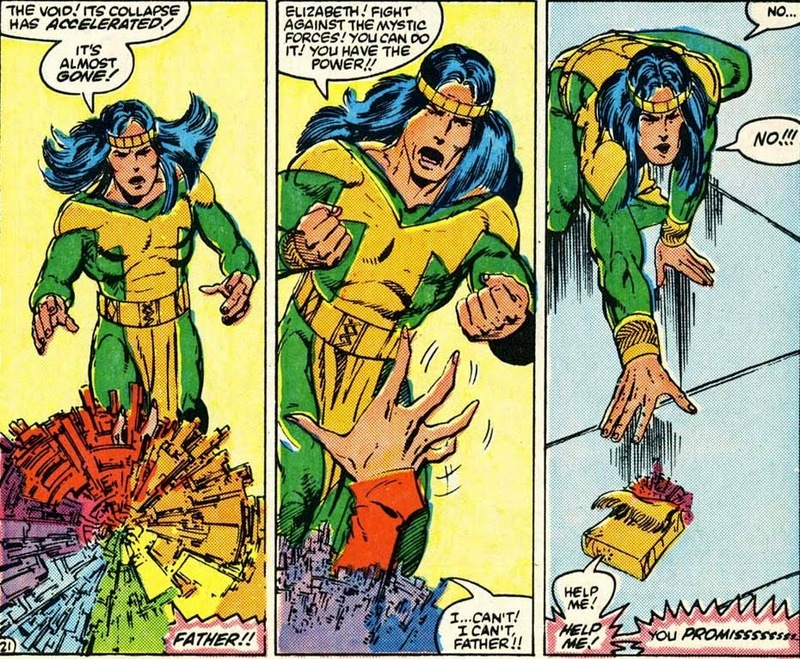 Seconds after that, back in Alpha Flight I#28, Box finally manages to reel in his catch of the day. 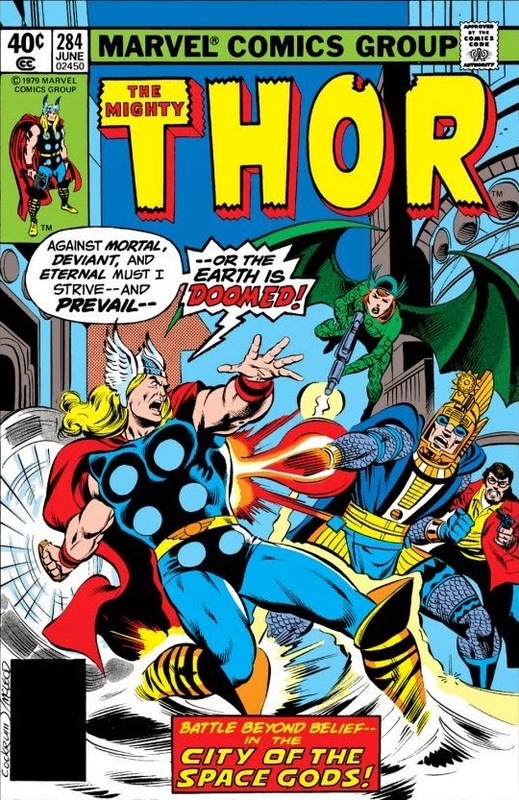 In Byrne's closing moments with the team they discover they were responsible for bringing the Hulk back to Earth following his banishment by Doctor Strange in #300 of his own book. 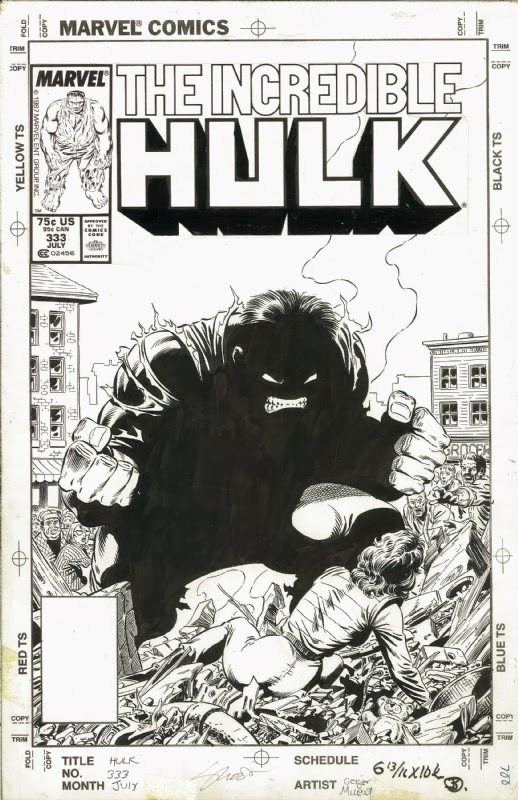 The Hulk, angry as always, punches a hole in Box and that's all Johnny wrote. 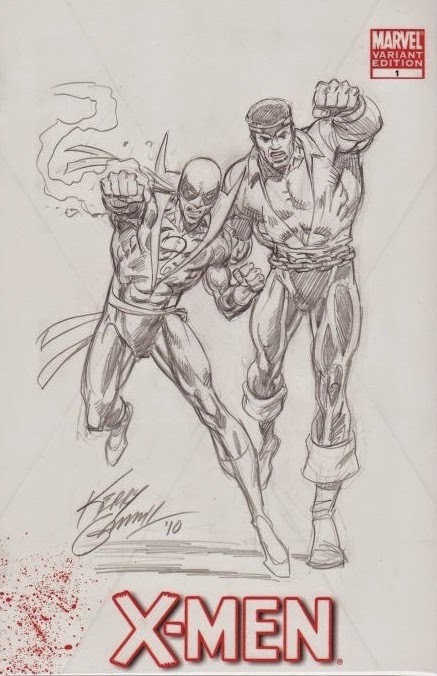 The new creative team of Bill Mantlo and Mike Mignola resolved the situation in Alpha Flight I#29 in the most elegant way possible... The Hulk simply left. 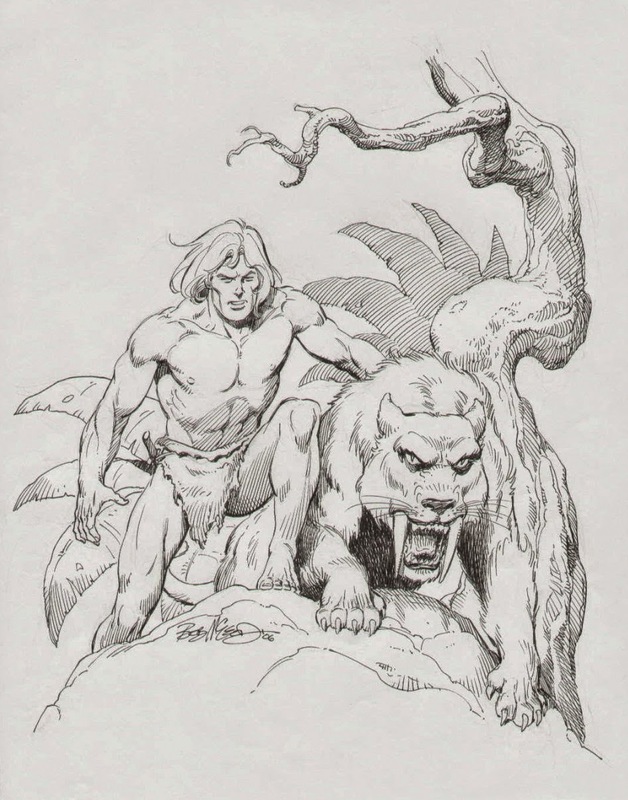 "He said he wanted to go back to the deserts..."
Fans of Alpha Flight most likely were fans of John Byrne first. After all, he was the one who (co)created the team and the main creative driving force behind the bulk of their adventures to date. 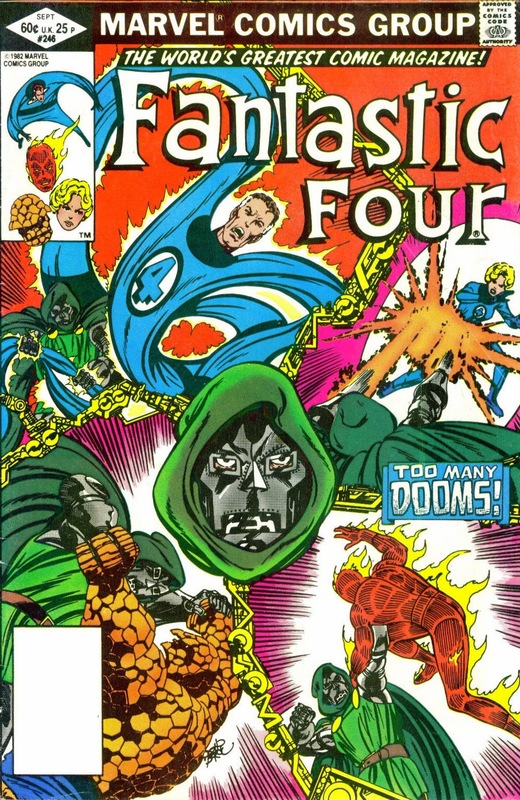 Imagine the culture shock if you were only a casual reader, happened to skip #28 and came in a month later to find Mantlo at the helm. 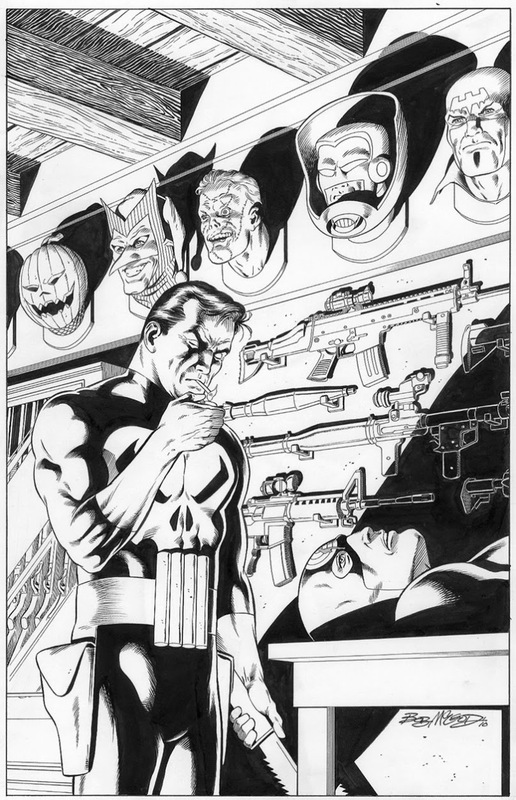 It wasn't the smoothest of transitions, in part because of the obvious visual differences between Mignola and Byrne art. 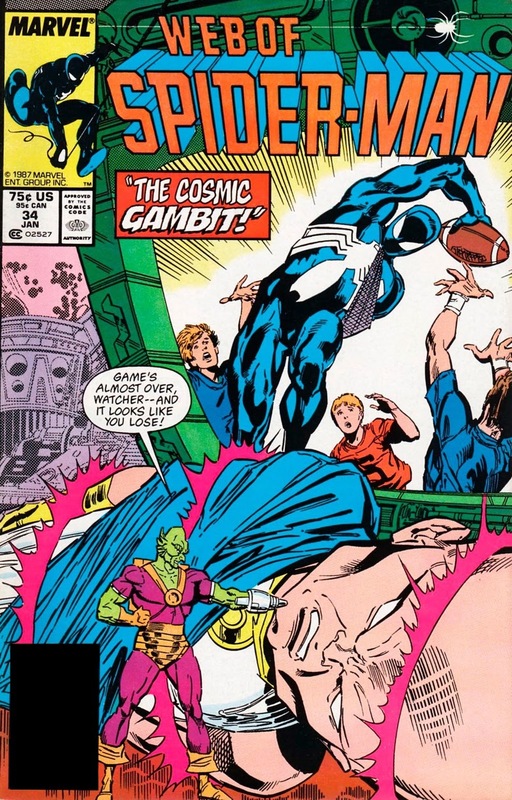 But let's not forget Mantlo's scripting also tended to be a bit more... verbose. 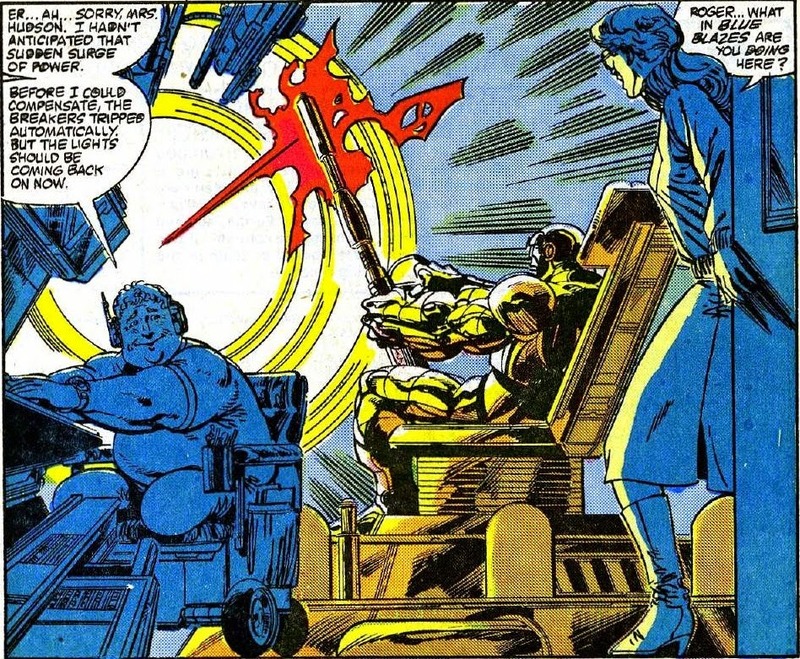 Take the last page of #29 for instance, in which Mantlo managed to cram in a lengthy motivational speech along with all the necessary set up for the team's new status quo. 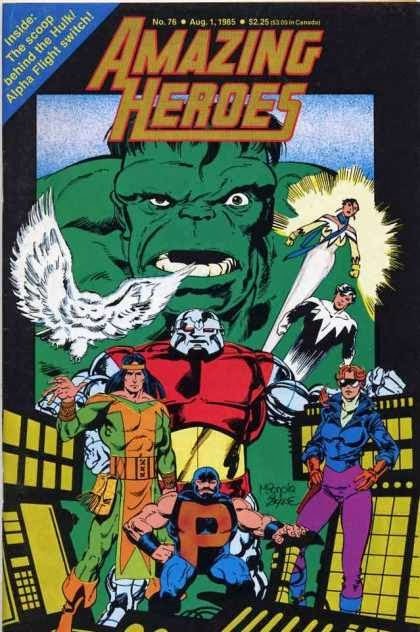 Mantlo wasted little time making the book his own, deciding Alpha Flight would be best off as an actual, properly organized team, complete with government funding. 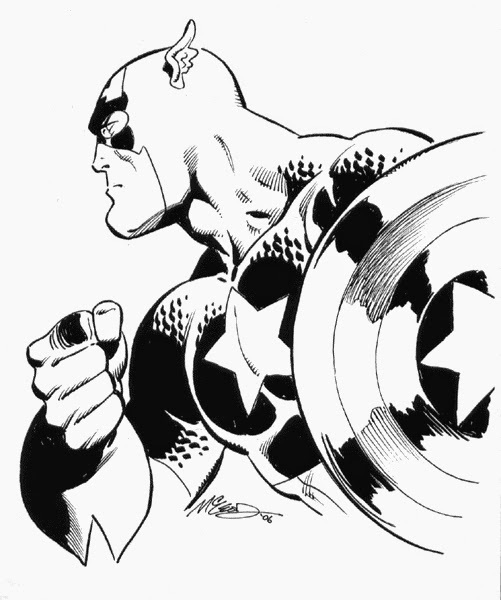 In a way, this move proved the inherent cyclical nature of comics. After a while, all the old tricks are new again. 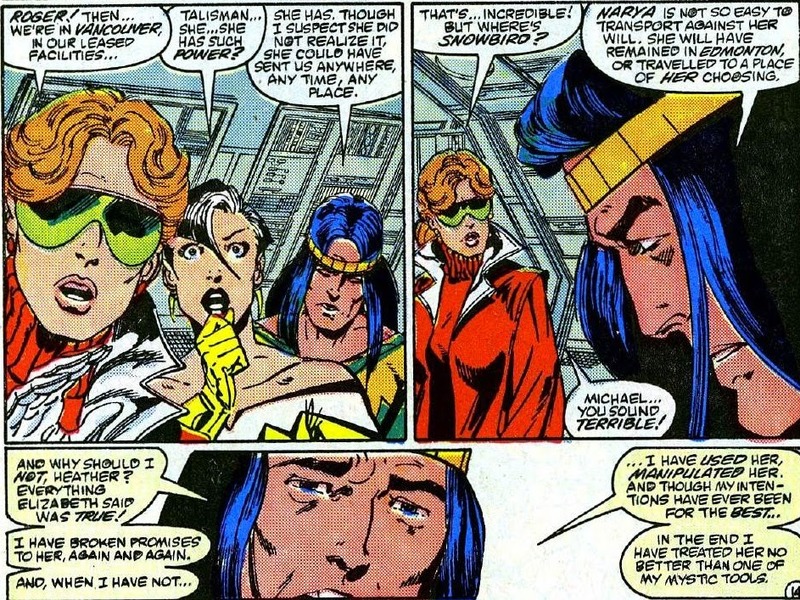 Case in point: Byrne kicked off Alpha Flight I#1 with the team completely defunded and out on the street. But as soon as he left, they were back in business with unlimited backing to boot. 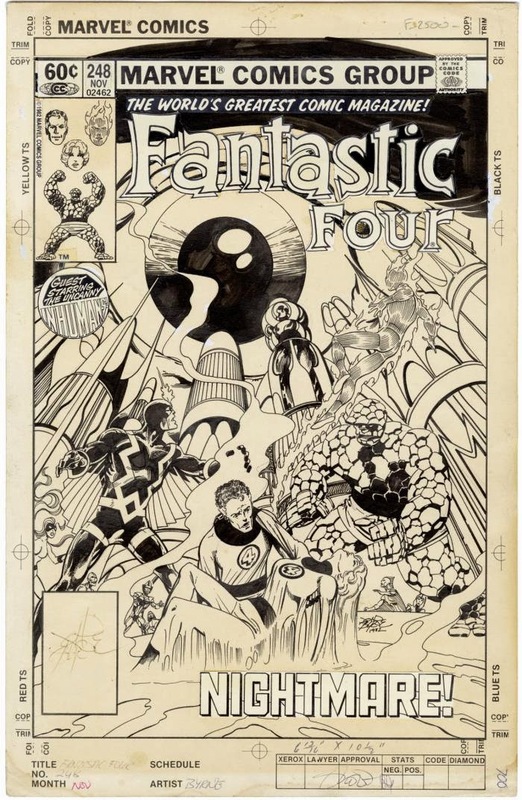 In closing... John Byrne's time with Alpha Flight is without a doubt the most beloved and best remembered period in the entire history of the team. His run has been reissued numerous times, presented in polished up collections, recolored and printed on high quality paper. But, 30+ years on, one has to wonder why John's take is considered the definitive "Flight". Could it simply be because he got there first? 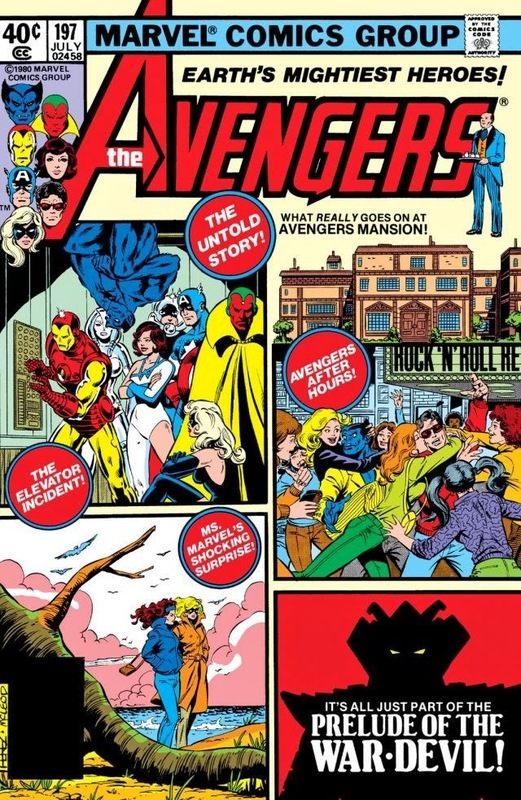 For one, Bill Mantlo stayed on considerably longer, chronicling the team's adventures until January 1989's #67. 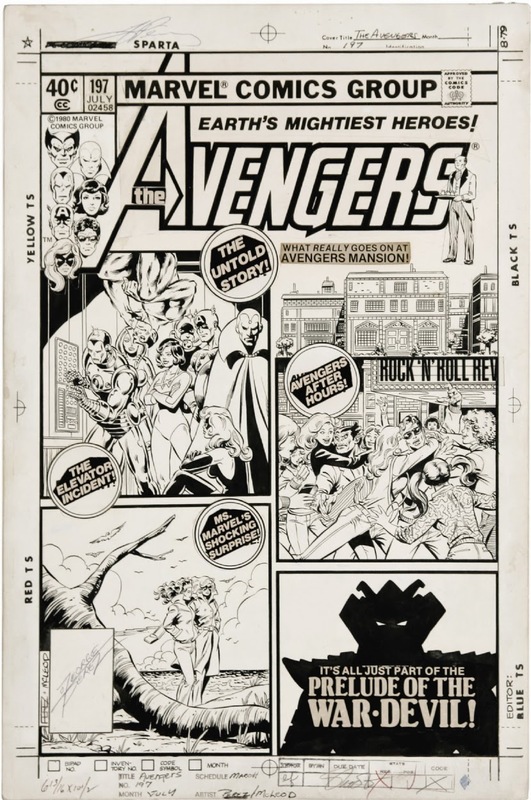 In fact, the first volume of the book lasted 130 issues. 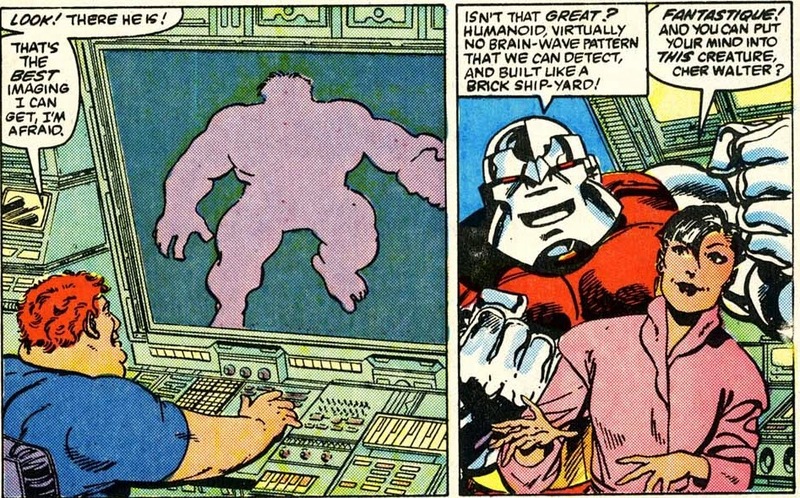 For most of that run Alpha Flight was in no way comparable to the non team appearing in Byrne's initial 28. 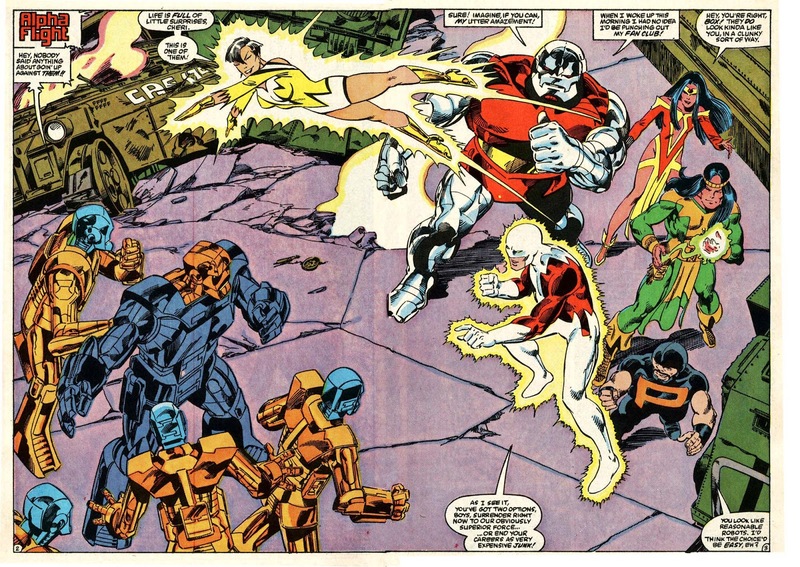 In interviews about his time on Alpha Flight, John Byrne has repeatedly stated he experimented to find out what would work, eventually settling on the non-team approach as the least terrible way to fulfill his contractual obligations. 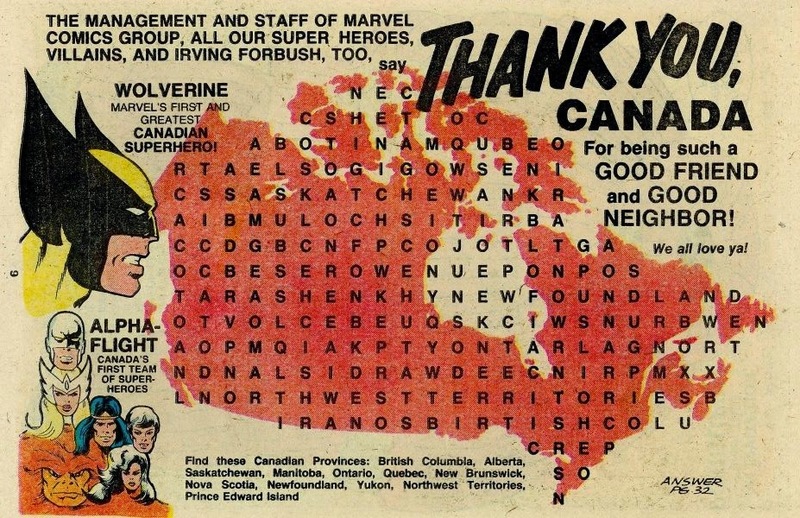 But despite all their bickering, Alpha Flight never came close to the Defenders in that respect... Perhaps in no small part thanks to the average Canadian's inherent politeness. So, what good is breaking the mold when the next person to come along simply uses another one? 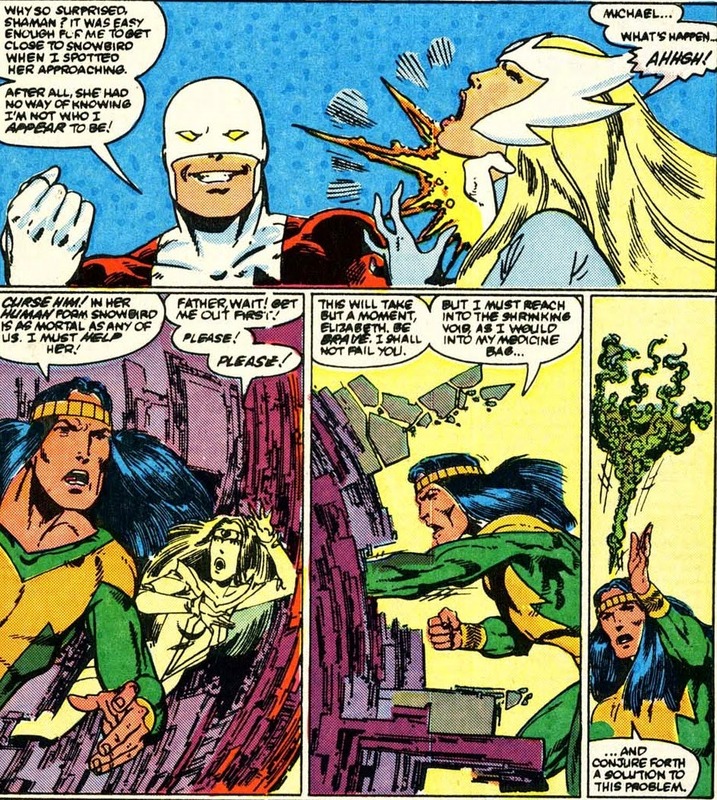 In the long run, was Byrne's Alpha Flight nothing more than an aberration? Yes and no. 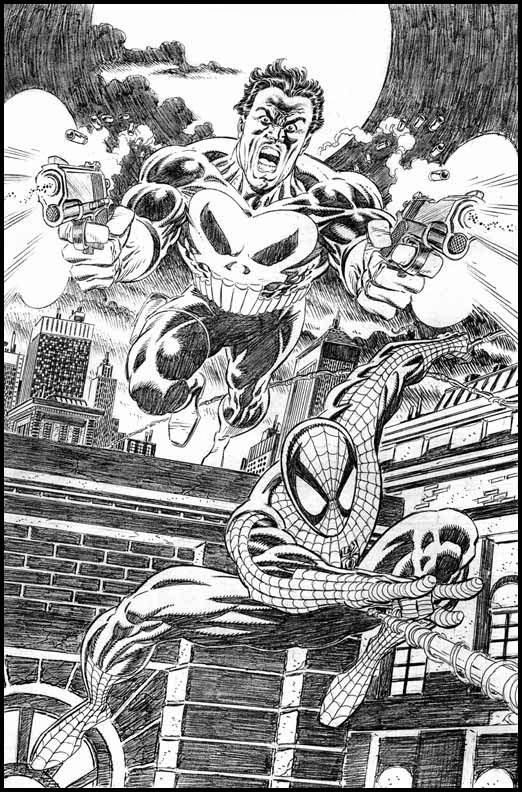 While it wasn't exactly comparable to what would follow, Byrne's work is a reminder art doesn't exist in a vacuum... Not even reluctant art. Even though Byrne himself had trouble finding a way to make the team work, his struggles served as an inspiration to all those who followed. To borrow a popular phrase from the X-Men franchise: "Omnia mutantur"... Everything changes, even the initial flight. 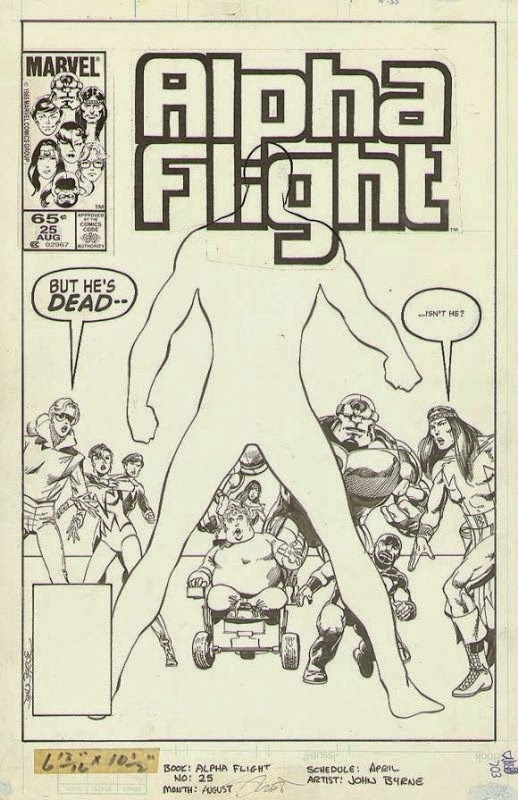 In the end, it's rather simple if not slightly paradoxical... John Byrne's Alpha Flight made us feel good, even if Alpha Flight under John Byrne didn't. ... And nothing else compares.